The entrance to Conover Cove is shallow at low tide and care must be exercised to avoid grounding. Boaters should approach the park with caution, due to numerous reefs and shoals in the area. Potable drinking water is not provided in this park. There are two private properties on the island; please respect them. Reservations are not accepted at this park; all campsites are on a first-come, first-served basis. Wallace Island Marine Provincial Park is only accessible by boat. This park lies in Trincomali Channel between Galiano Island and the northern tip of Saltspring Island, off southern Vancouver Island. Boats can enter the sheltered anchorages at Princess Bay and Conover Cove from Houston Channel. Boaters can reference marine chart #3442 and #3463 for more information on this area. Nearby communities include: Galiano Island, Saltspring Island, Victoria, Nanaimo, Duncan. History: This island, originally charted as “Narrow Island”, was named after Capt. Wallace Houstoun, who first surveyed the area in the 1850s. Twisted fruit trees mark the remnants of the garden and orchard planted by Jeremiah Chivers, a Scotsman who retired here after unsuccessful adventures in the interior gold rushes. Chivers lived alone on the island, never marrying, and died here in 1927 at the age of 92. After the Second World War, David Conover purchased the island and moved here with his wife Jeanne. The couple developed a very successful holiday resort on Wallace Island, and Conover became a successful author, writing four books – “Once Upon An Island”, “One Man’s Island”, “Sitting On A Saltspring” and “Finding Marilyn, A Resource”. In the first two books he described the couple’s struggles and joys after their purchase of the land in 1946. Their resort, the Royal Cedar Cottages, was advertised as having “a modern well-stocked store, cabins, recreation hall and boat rentals.” In the mid to late 1960s, Conover sold the majority of the island to a group of teachers from Seattle. Disagreements among the owners led to court proceedings and the property was again put up for sale. Wallace Island was purchased through the court ordered sale and became a provincial marine park in 1990 through the cooperative efforts of the provincial government and BC Marine Parks Forever. Conservation: The flora of this island is typical of many of the Gulf Islands – with dry summers, many plants are adapted to germinate and grow in the winter, flower in early spring and become dormant by early summer. The best time for botanical viewing is March through May. Wildlife: Black-tailed deer are the largest land animals in the park. Sightings of river otters, mink and harbour seals are common. Sea lions can be found in the area in winter, but disappear during the height of the breeding season in July and August. The number of Bald eagles has greatly increased in the area in the last 30 years and are now frequently sighted. Bird watching here is most productive in the spring, winter and fall. 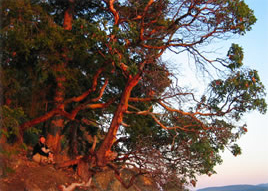 Wallace Island Marine Provincial Park is a popular stopover and destination point for paddlers. Paddlers can launch from Saltspring Island, Galiano Island and a number of other Vancouver Island locations, including Duncan and Ladysmith. Be prepared for potentially strong currents and unpredictable weather in this area. The park is surrounded by ocean waters and provides saltwater fishing opportunities, subject to periodic closures. Rockfish Conservation Areas occur within this park. Fishing activities are limited in Rockfish Conservation Areas. Before you go fishing please refer to the Rockfish Conservation Area descriptions available from Fisheries and Oceans (DFO). A series of fairly flat, well-maintained walking/hiking trails travel throughout the park, providing views of the folded rock formations that compose the island. Head south to Panther Point, named after the Panther, a ship that ran aground here in 1874. A trail also leads partway out to the point at Princess Cove, as well as one that leads to Chivers Point at the northwest end of the park. An information shelter at the head of the wharf at Conover Cove offers more details on walking routes. A picnic shelter and open grass fields offer day-use opportunities at Conover Cove. Docking facilities are located at Conover Cove, as well as stern tie rings at both Conover Cove and Princess Cove. Anchorage is available in Conover Cove and Princess Cove. When anchoring, please ensure you are not blocking stern tie rings or access to and from the docks. The entrance to Conover Cove is shallow at low tide and care must be exercised to avoid grounding. Boaters should not tie up at the portion of the dock reserved for BC Parks staff. Pit toilets are located at Conover Cove and Chivers Point. Chivers Point and Cabin Bay are ideal for kayak camping. Fees apply for overnight camping and are payable at self-registration vaults. Please practice “Leave No Trace” camping ethics. Garbage facilities are not provided; visitors must pack out all of their garbage. Fees for overnight camping apply year-round and are payable at self-registration vaults or through the Backcountry Registration System.